Soak the gelatine in 3 tbsp cold water for 10 minutes. Meanwhile, dissolve the sugar in 75ml water in a pan on a very low heat. Whizz the mango in a blender until smooth. Add the gelatine and water to the hot sugar mixture; stir till dissolved. Keep the heat very low - the gelatine must not boil. Transfer the gelatine mixture to the blender and blitz again with the mango, coconut milk and grated zest of 1 lime. Pour into 6 cups or glasses (each about 150ml) and put in the fridge for at least 3 hours. 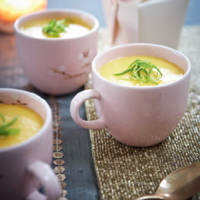 Use the zest of the second lime to decorate the puddings before serving.